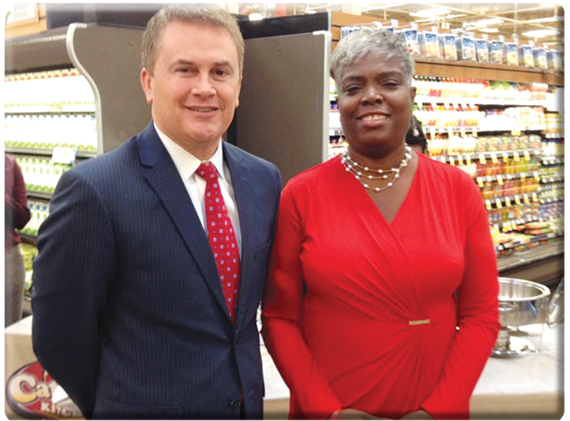 Agriculture Commissioner James Comer chats with Catrina Hill, co-founder of Catrina's Kitchen, at the announcement of the Kentucky Proud-Kroger partnership in November 2014 in Lexington. FRANKFORT, Ky. – Kentucky Proud members and a Kroger official say they’ve seen positive results in the first six months of the partnership between the supermarket chain and the state’s official farm marketing program. Tim McGurk, public affairs manager for Kroger’s Louisville division, agreed that the partnership has been successful so far. Last November, Commissioner Comer announced that Kroger would sell 125 Kentucky Proud products in 88 stores throughout the Commonwealth. Commissioner Comer and Kroger officials unveiled a Kentucky Proud kiosk that was placed in the Kroger stores. Kroger supported the initiative with a statewide television advertising campaign in which select participating Kentucky Proud members tell their stories. In February, the Kentucky Department of Agriculture hosted a meeting of 41 Kentucky Proud members with three Kentucky-based retail distributors in an event dubbed “Fish Tank.” The distributors assessed the producers’ operations and gave them pointers on getting their businesses retail-ready, whether in Kroger or other retailers. The event was so popular that the department plans to hold another as soon as enough Kentucky Proud members express an interest.